We’ve heard this story before. Debut feature does well on the festival circuit, gets lauded at Sundance, bought by the Weinsteins, tipped for Oscars. There’s always one token indie every year that gets enough praise and acclaim to sneak a good opening weekend and pick up some gongs. Right now, it’s looking like Fruitvale Station might stick its head above the parapet, and if there’s any justice it won’t come down for a while. Fruitvale Station, from director Ryan Coogler, tells the story of Oscar Grant’s last day alive, before he was shot in the back by a police officer whilst “resisting arrest”. Oscar was on his way back from San Francisco in the early hours of January 1 2009, when an altercation occurred on the train, which led to him frog-marched off, held to the ground, and shot. We know this, because it was all caught on camera – everyone got their phones out and started filming, like it was second nature, footage which helped lead to the officer in question’s prosecution – homicide, reduced to involuntary manslaughter. 2 years, with time served, out in 11 months. The film opens with these facts. We see the shaky phone footage of something going on, it’s hard to tell what but you can see several young black men being forcibly restrained by white police officers – plus ca change – and then you hear the gunshot, and the scream, and we’re into the film. It’s a bold opening, and incredibly effective, as it allows Coogler to get away with, really, not showing a whole lot. There’s no real narrative here – we begin with Oscar and his girlfriend (Melonie Diaz) post-argument, we learn they’ve got a kid, we know it’s New Year’s Eve and his mother’s (Octavia Spencer) birthday…but that’s it. What Coogler shows us in the portion of the film leading up to the shooting is just routine. Oscar picking up food, trying to get his job back, going to sell some dope, throwing the dope away. There are no beats being hit, it’s pure realism. 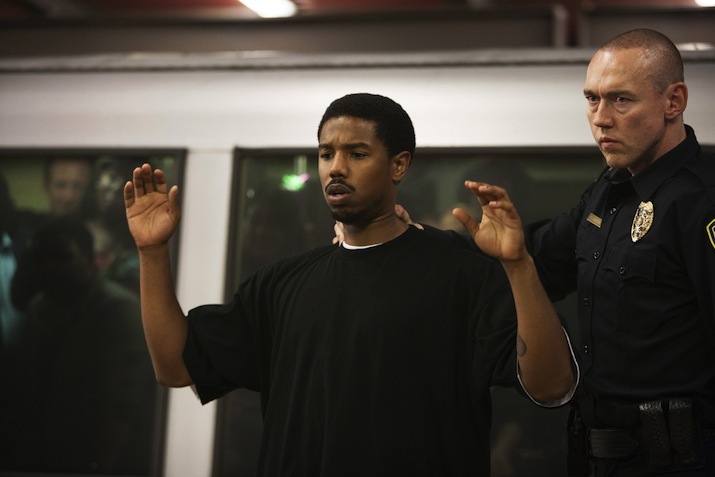 So, what makes Fruitvale Station so compelling, and so important? Because make no mistake, this is an important film, one that everybody should watch. Well, for one, when Coogler does go off-piste, he does it well. The scene where Oscar carries a dying dog from the middle of the road is well played, stark enough to stay with you but restrained enough not to feel like a forced metaphor. Also, there’s a lot of interesting things said about role models, particularly for African-Americans. It begins with an Oprah Winfrey quote, but the only time we see Oprah she’s on a tv screen for a split second – I think we hear her say “blah blah”. Perhaps not a loaded shot at her, but certainly at the lack of diversity and representation of black people in culture. It seems to me though that what Fruitvale Station is really saying, above ideas of institutionalised racism and police brutality towards black people, is to do with technology. We begin with footage that wouldn’t exist were it not for technological advances. Throughout the film, Oscar is using his phone, and this is foregrounded with the messages appearing on screen, a little jarring at first but you soon get used to it. Often in cinema mobile technology is seen to be disconnecting, isolating, not so here. Here, it’s the opposite. Here, it brings people together, it affects social change. Here, it’s important. This is not an easy movie to watch. The final act, post shooting, is distressing, and the use of documentary footage in the epilogue will break your heart. But don’t let that dissuade you from seeing it. It’s tight, subtle, well stylized and has a really vital message at its core. Everyone should see it.